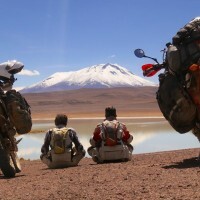 During the last weeks we descended from the high peaks of the Andes to lower parts of the country. 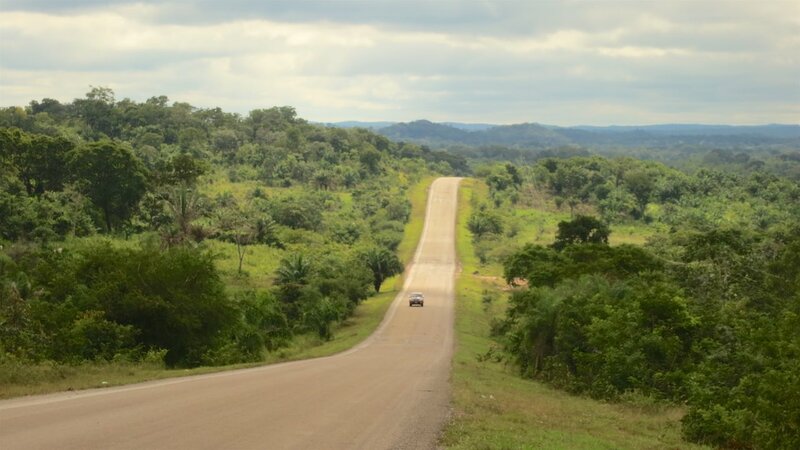 Now, from Santa Cruz, we continue our slow descent until we reach the Bolivian lowlands after a few hours. From the last hill, we have a wide view over the flat land ahead of us. To the horizon, everything is green! No buildings, no utility- or telephone poles, but only forest and the road that cuts through it as a grey stripe. The main road to the north is paved and built on a dike. And that’s a good thing, because it has rained a lot and it’s very wet beside the road. Canals have burst their banks and parts of the forest are completely under water. Side roads that are not paved, have turned into muddy paths with deep tracks of cars that already drove through the mud. 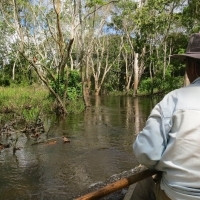 In the rainy season large parts of the Bolivian jungle are cut off and can only be reached by air or by boat. 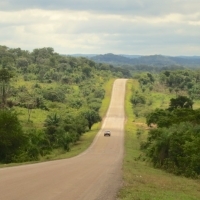 The rainy season is now coming to an end and we have heard that all roads are open. If it stays dry the next few days, we should be able to ride through the jungle to the capital La Paz. Let’s see. The farther we descended from the Andes, the warmer the weather also became. Now that we have almost reached the lowest point of the country it is tropically hot and very humid. My motorcycle suit sticks to my body and my feet are hot and swollen in my thick leather boots. We don’t really like the humid weather, but the insects apparently love it! Within an hour our helmets are dirty from all mosquitoes and flies that stick on it. Whenever we stop we hear a never-ending buzzing and are greeted by strange flying animals with big eyes and even bigger stingers. But those are not the ones that worry us, because on the road we see even stranger beings. 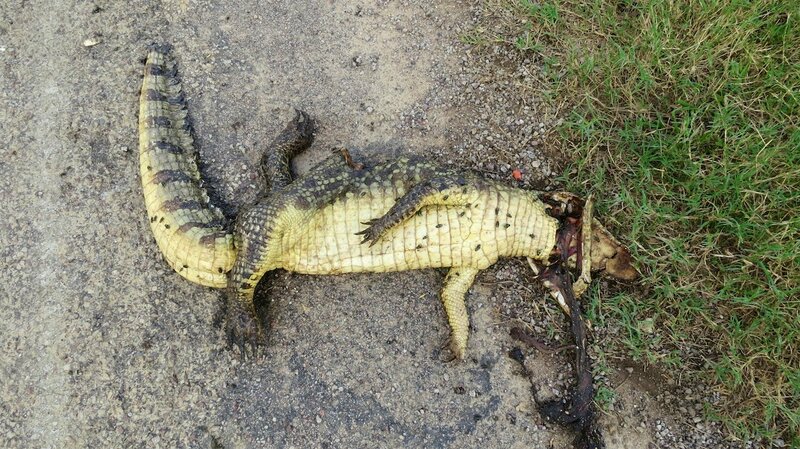 We first pass a flat crocodile and not long after a dead snake of nearly three meters! 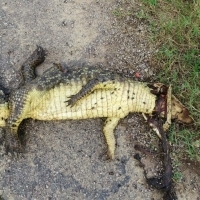 Not quite the roadkill we are used to at home! Every next time I find a spot to pee, I look with a little more suspicion to the overflowing canals. We pass several ’estancias’, large cattle farms. 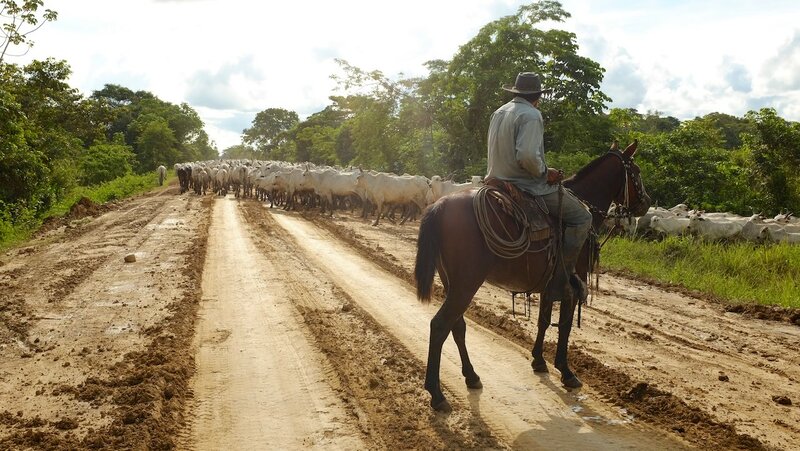 With the herd of cows, you will always find a few ’gauchos’, South American cowboys who keep an eye on the cattle from their horses. Hat on their head, lasso attached to their saddle and a dog on their side that helps to herd the cows. 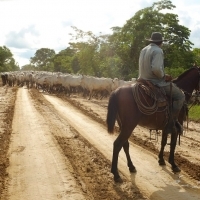 The main road is used by them to herd the cows from a flooded pasture to dryer grounds. The cows take up the entire road. We keep riding behind them, because the cooperation between man, horse and dog is great to watch. Many estancias were built by Spanish colonists and kept with the family by later generations. The Spanish influences are clearly reflected in the style of the old mansions. The people we meet here also look Southern European. Their facial features are clearly different from the characteristic faces of the people we have seen in the Andes. 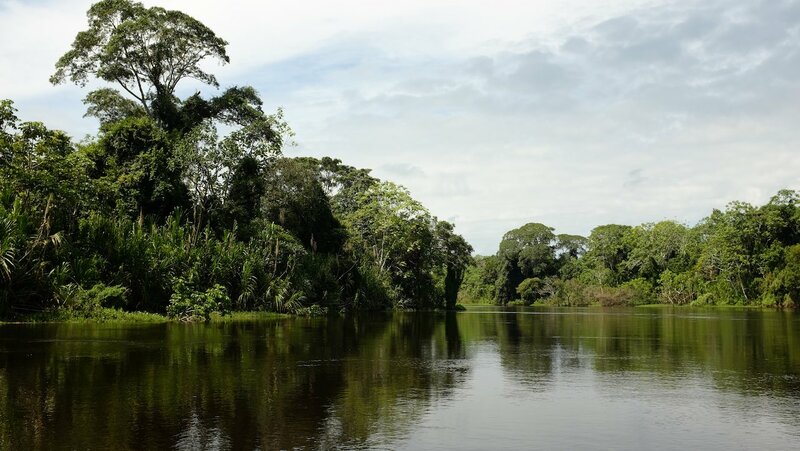 The grasslands around the estancias are interspersed with pieces of dense jungle: dozens of species of trees, plants and shrubs and high grass. It all seems to shoot up from the ground. It is not difficult to imagine that the jungle would overgrow everything if the cows would not graze the land. The first day we ride from Santa Cruz just over 300 kilometers to the Guarayos Ascencion, a former Jesuit mission in the jungle. 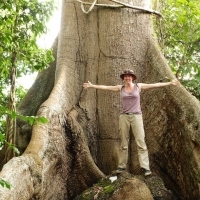 The village is situated right in the middle between Santa Cruz and Trinidad and is a perfect place to stay. The next day we are back on the bikes again early in the morning, because it’s still quite a long way. We hardly see other traffic. Only at the end of the day it is a a bit busier on the road, first some cars, but then also motorcycles. The latter is usually the sign that we are near a larger town. And that’s right, because we’re almost in Trinidad. Also founded as a Jesuit mission in the jungle Trinidad has become the largest city in the region. 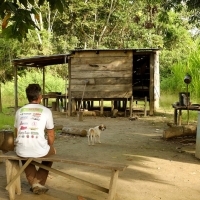 It’s an important hub and the starting point for expeditions to the Amazon. 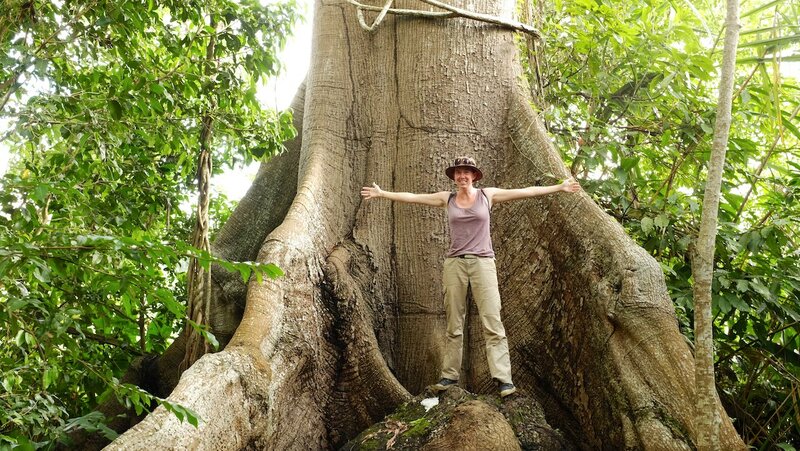 We also want to explore the jungle from Trinidad. We park in front of a small hostel. The owner is a spirited 70-year-old lady who reminds me of my grandmother. She is clearly the boss and keeps a close eye on everyone, a real South American ‘doña‘. She gives us a room at the end of the corridor and we agree that we can leave our gear and motorbikes in the hostel when we will go to the jungle for a few days. Great! 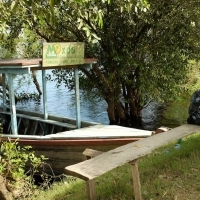 In a travel agency in central Trinidad we book a four-day boat trip. 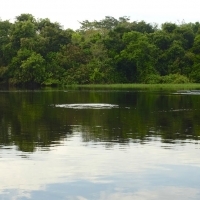 We not only want to experience in the jungle up close, but also want to look for freshwater dolphins. It wont’ be easy because they are threatened with extinction, but here in Bolivia we should be able to find them. After a day of lounging at the hostel, we’re back at the travel agency the next morning. This time with a small bag of clothes, charged camera batteries and enough insect repellent for an entire village. The manager introduces us to Pedro, our guide for the next days. He is a big man with a friendly face and a firm handshake. On the way to the harbour, he tells us in broken English about Trinidad and his work as a guide. He is visibly relieved when we tell him that we have learned Spanish and directly switches to rapid Spanish. Wow, he talks really fast. We understand fragments of his story and give him a friendly nod when we are getting dizzy. It will be good to practice our Spanish the coming days. Once in the harbor, we start unloading the car and carry the stuff onto one of the boats. It is a long wooden boat without a cabin, with a roof and narrow benches along the side. We are taking a lot of stuff: an outboard engine, jerry cans with petrol, large gas cylinders, a stove, a generator, mattresses, mosquito nets, water bottles and bags full of food. All we need in the coming days. If the boat is loaded, Pedro still seems to wait for something. From his rapid Spanish we understand that his wife will bring more food. A small moped stops at the quay and a smiling lady and a little shy girl get off. Once they are on board, Pedro starts the engine and slowly starts moving backwards. Then it turns out that we had not been waiting for the food, but for the cook! His wife Alice and his daughter Lucia will join us. We did not expect a family trip, but we can see the fun of it. Chances are she is the better cook anyway, so this can only be good. Then we set off, Pedro and his family in the back of the boat and we in the front. We move out of the harbour and follow the sharp bend in the river. Once we are around the corner, we are right in the middle of the jungle! The sounds of activity in the harbour have been replaced by the sound of the engine, the splashing water and the monotonous hum of the jungle. We immediately see many birds, particularly kingfishers and various species of herons. 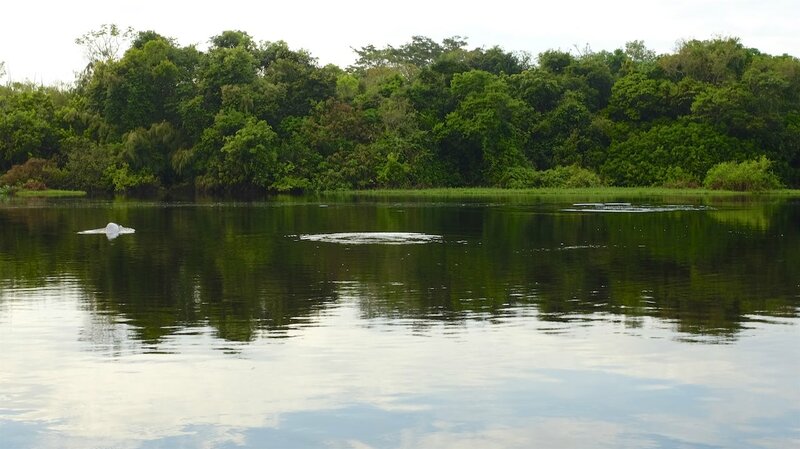 And then, not far from the boat, we suddenly spot a pink dorsal fin above water: a river dolphin! The beautiful pink dolphin with its long pointed snout hangs around for a while and then leaves just as suddenly as he had come up. Great, we had not expected to see a dolphin this soon! 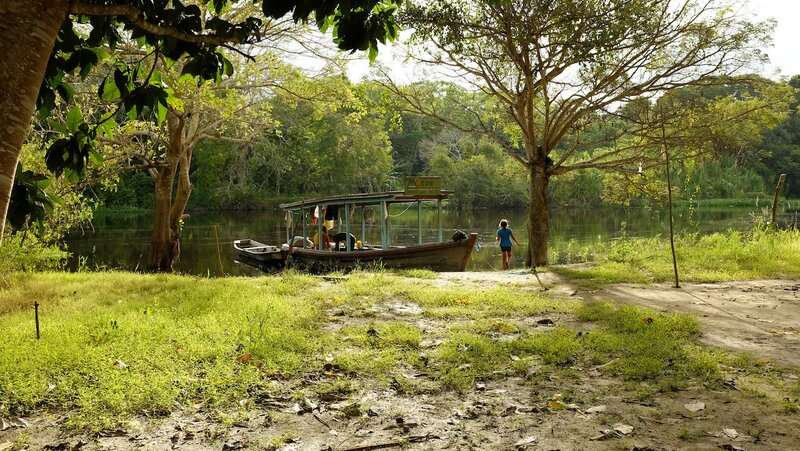 We float further down the river, deeper into the jungle and feel very far away from civilization. In reality we are probably still very close to Trinidad as the crow flies, because of the many bends in the river. 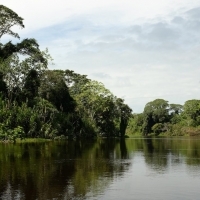 The forest is dense on both sides of the river. In most places you can only get on shore after cutting away a lot of branches and bushes. In all that green it is sometimes difficult to recognize the birds and animals, but Pedro has a trained eye and points us in the right direction. 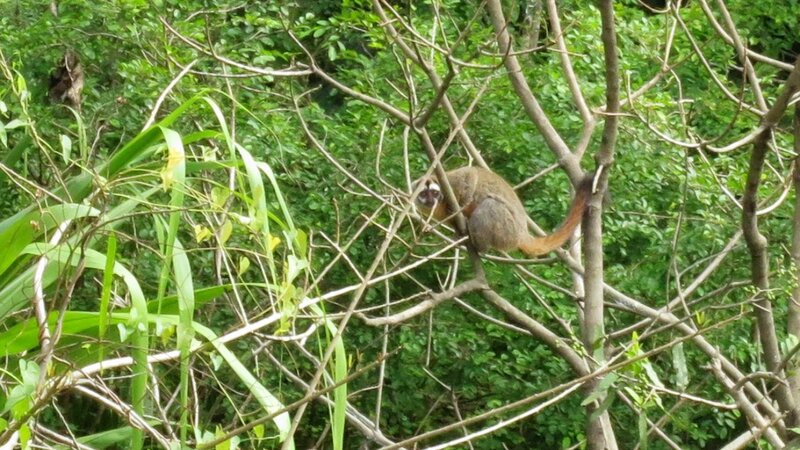 We spot big yellow parrots, cormorants, kingfishers, turtles and various species of monkeys. At the end of the day we see an open place in the forest, with a simple house and some pigs and chickens around it. 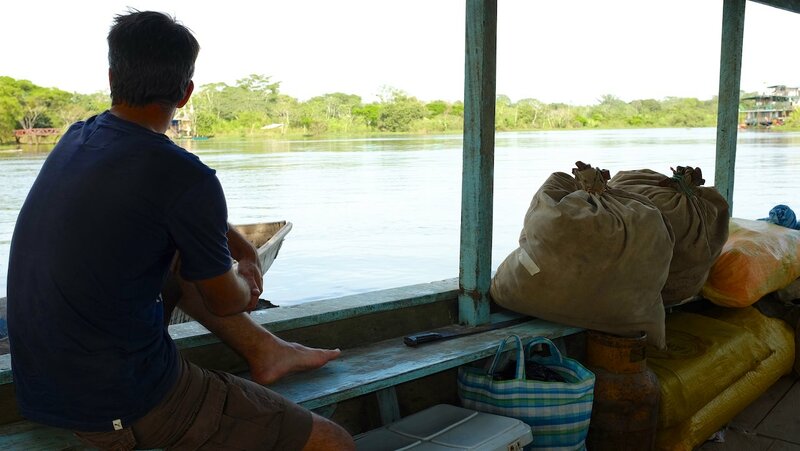 Pedro steers the boat to the shore and waves to the women and children who are watching us from the house. We will sleep here tonight and are taken to a bedroom at the front of the house. It’s not much, but has everything we need: a bed and a bathroom with a toilet and a shower. When we come out of our room after a quick shower, it’s already pitch black outside. We eat some delicious soup for dinner and, even tough it must still be very early, go to bed anyway. It was a long hot day. With the monotonous hum of the jungle in the background we fall asleep quickly. As soon as the sun rises the next morning, life on the farm begins. We get dressed and go outside to look out over the river. The water is smooth as glass until suddenly two dolphins appear on the surface and make large circles on the water. They pop up, disappear under water again and then show themselves again a few meters further. For over half an hour we watch while they are hunting for their breakfast! A real treat! Our hosts are waving us goodbye as we move back towards the harbour where we will pick up two French tourists. Once there, there are not two, but four people waiting for us: the French couple and two local boys. They turn out to be the sons of Pedro. It’s Saturday so they are free from school and will go fishing with us. The family is complete! The small boat is quite full and the engine is struggling. Especially in the strong current it seems as if we stand still. There is not enough food on board to fill all the hungry mouths, so we have to catch some fish for our lunch. 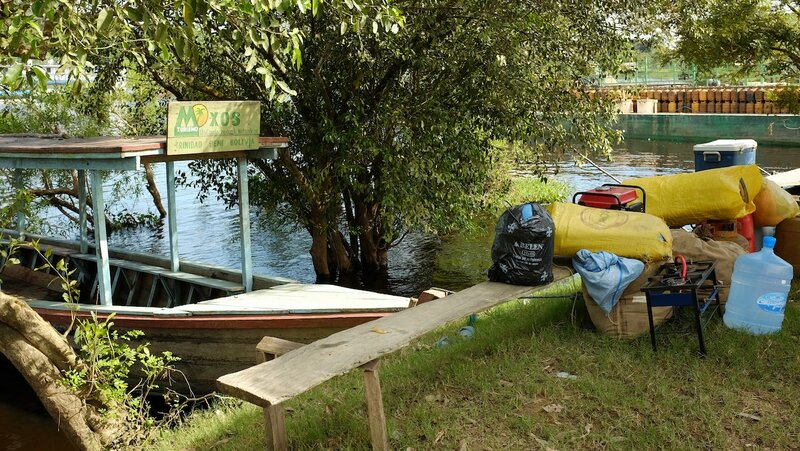 Pedro ties the large boat to a low-hanging tree and places the outboard engine on a small wooden canoe. 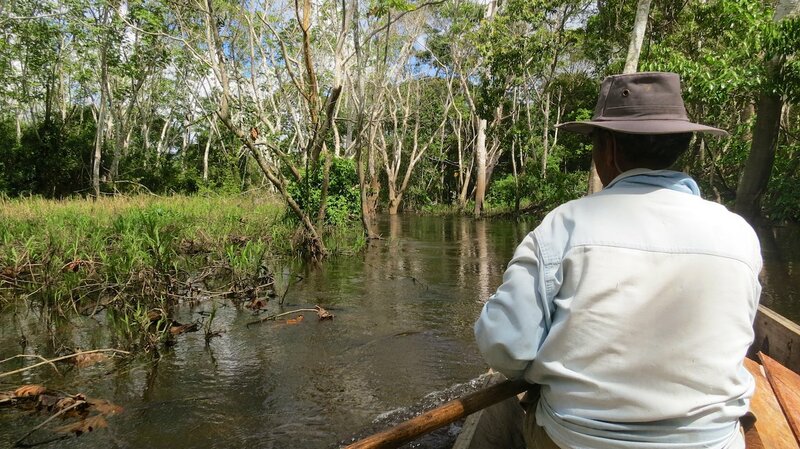 Once we are all in the canoe, he steers the small boat right towards the jungle. For a moment I think we are going in the wrong way, but it appears that this is indeed his intention. One of the sons moves some branches aside and just like that we float into the flooded forest. In some places it is very shallow. We feel the branches scrape on the bottom of the boat, but we can keep going. We are each given a fishing rod: a long stick with a thick line and a huge hook. As bait we use a piece of meat. We follow the fishing technique of Pedro and his sons, who beat occasionally with their stick on the water. 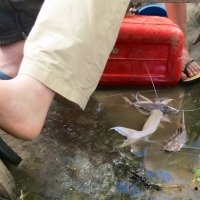 It does not take long before we have all caught a catfish. They are not big, but big enough for lunch. They are floundering on the bottom of the boat and somehow manage to end up right in front of my feet every time. I don’t like it and try to keep my balance on the narrow wooden bench, while holding my feet in the air. When Pedro hits the throttle right at that moment, I lose my balance and fall backwards screaming right between the fish. Yuck. Back in the big boat Alice makes a delicious lunch: rice with salad, a spicy bean mixture and a piece of catfish for everyone. It tastes good. Rosy from the nice lunch and the warm weather, everyone finds a spot in the shade to relax. We take the sons of Pedro back to the harbour and set off again. Lucia is not shy anymore and sits with us to chat all day. 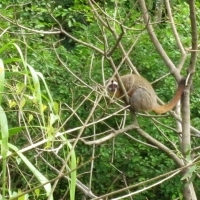 She looks at the monkeys through our binoculars with Peter and laughs in surprise when they are suddenly so close. When we’re almost at our destination, Alice takes us on shore for a walk. There is a barely visible hole in the bushes, where a path starts through the dense forest. Alice is in front of us and cuts away branches that are overgrowing the path with a large machete. The trees in the forest are huge and must be very old. 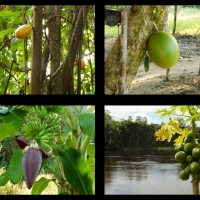 Alice tells about the plants they use in their daily lives, lets us taste fresh cocoa beans and shows us the skull of a crocodile. The path leads to an open field in the forest with banana trees, two wooden huts and a vegetable garden. We are kindly greeted by a little dog. The yard is right next to the river, were we spot our boat. Pedro is talking to an older gentleman and then introduces us to Don Pablo, the owner of the piece of land and our host for the night. Pedro takes us to one of the cabins, our ’bush hotel’ for the next two nights. 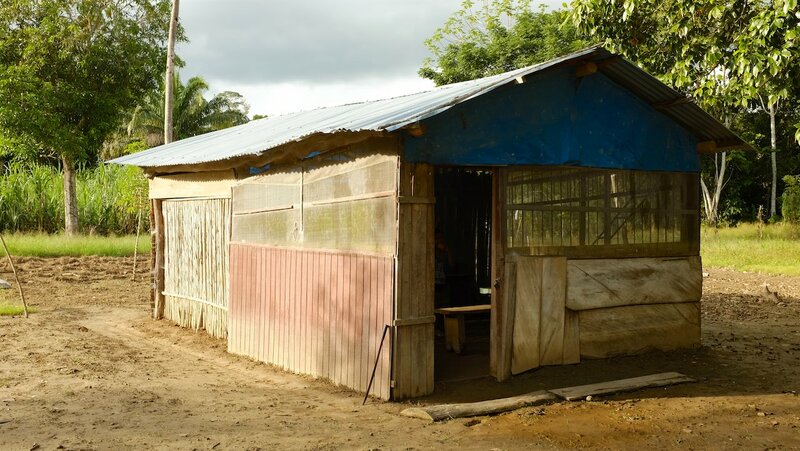 It is made of wood, with mosquito netted windows and a corrugated roof. The cabin has two makeshift beds: shelves that are placed on thick tree trunks, with a mattress on top and a mosquito net around it. 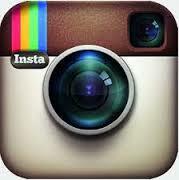 The mattress is made of plastic bags filled with straw, which some colored cloths around it. There is no electricity and no bathroom. For the shower we step into the river and for the toilet we must find a place in the forest. This place is even more basic than yesterday. At first we feel a bit worried, but that restless feeling is soon replaced by another feeling: this is part of the adventure and the jungle experience. Fortunately, we are somewhat hardened so we will surely survive these two nights. We have our cotton sheet sleeping bag and brought our inflatable pillows so we can make it our own ‘home’. On the trip we really learned to feel at home anywhere and the saying “Home is where the heart is” does really apply to us. Alice is already preparing dinner. Meanwhile, we look around on the farm of Don Pablo as he tells us about his life in the jungle. 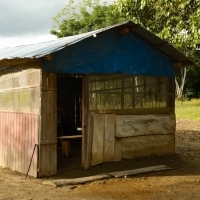 Our hut is not very different from the cabin of Don Pablo. The only difference is maybe the photo frame with yellowed photographs hanging on the wall of his hut and his old radio that is playing a pleasant song. 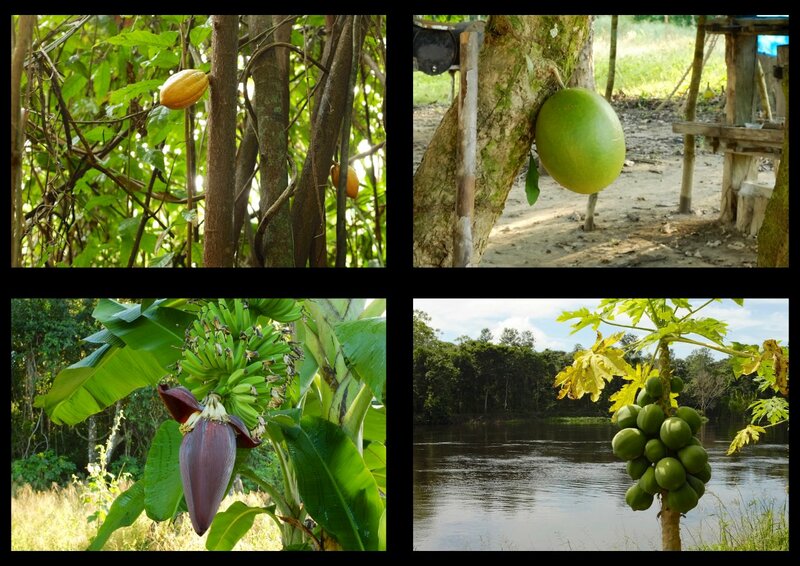 He lives from what his farm and the river give him: bananas, cassava, maize, sugar cane, coconuts, papayas and lots of fish. For coffee, tea and rice, he has to go to the village. He doesn’t have many possessions and makes much of his furniture himself. Despite his age, he looks still very strong. It is obvious that he has to work very hard. It’s a lonely life because he lives here by himself and his neighbours live many kilometers away. Especially now that he is older and has more health problems, that distance is difficult. The tourists Pedro takes here are a welcome distraction. Moreover, they also bring food and drinks from the city. 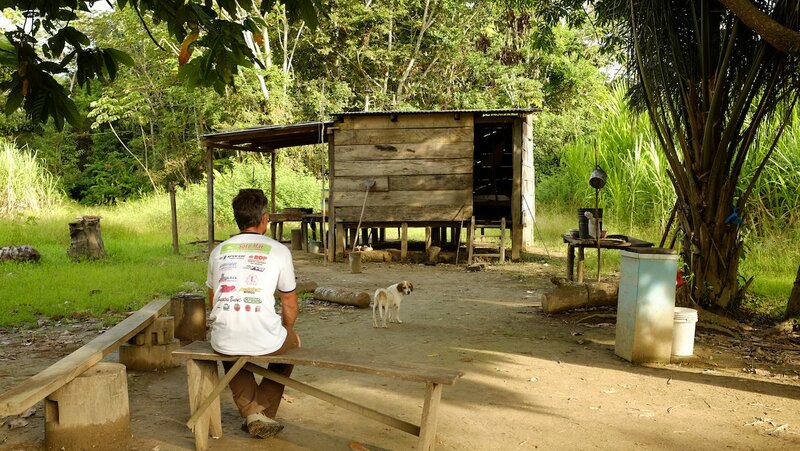 Despite the loneliness, Don Pablo seems mainly to be very happy here in the woods with his dog and his radio. The food is ready and served in our cabin. We ask if we can eat on the boat, but Alice wants none of it. Kindly but urgently she sends us back to the hut. Eating outside is not possible because of the mosquitoes. We still think that she is exaggerating, when we suddenly hear the buzzing swell once it starts to get dark. It keeps getting louder, as if the volume of the jungle has just been turned up. Within no time we see a huge cloud of mosquitoes in front of the window. We’ve never seen anything like this before! Pedro, who is still standing outside, hits his legs and arms with a rag to keep the beasts away. Going outside to pee will be quite an adventure, because there is no insects repellent that can beat this crowd! And that’s not the only junglesurprise. While we quietly enjoy our dinner, we are startled by a very strange sound. A low and loud sound like a freight train coming closer. First we hear it to our left, then right and then suddenly very close to the cabin. Now, it sounds more like a growl of a huge monster. It is like the zombies have risen! “Howler monkeys!” says Pedro, when he sees our frightened faces. Different groups of monkeys call to each other now the sun sets. It’s the scariest animal sound we’ve ever heard! ** It’s a good thing that they are high up in the tree, because otherwise I would not have dared to go out to pee at all! Not long after dinner (and the inevitable sanitary stop in the dark forest) we crawl into our bed. It takes some getting used to the hard straw mattress, but after some turning and hitting the mattress we find a spot. The roaring has ceased and the buzzing is softer. It is night in the jungle. The next morning we move up the river. It’s a beautiful trip, with a lot of birds and monkeys. We go all the way to a place where the river joins a much larger river. It is so wide we cannot even see the other side. The water is lighter and mixes at the junction with the dark water of the small river. Not only very beautiful, but also a good place for dolphins to hunt, because here they show up again. 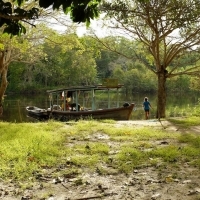 On the way back we go hunting as well, because we are going piranha fishing! We take the wooden canoe and float through a narrow side arm that leads to a lake that according to Pedro is full of the little biters. Better not make the boat rock too much, because this is not a good place to fall in the water. With a machete Pedro cuts the meat into pieces. As soon as I’ve thrown in, I instantly feel the fish pulling on the line. When I bring up the hook the piece of meat is already considerably smaller. The first three pieces of meat are eaten from the hook completely, without me catching a fish. Pedro has more success and shows us some of this fishing techniques.. That helps, because not long after Peter catches his first piranha. It’s a big one, with a beautiful red colour and a set of razor-sharp teeth. Once I have copied the technique, I also catch a piranha. I’ve never been very tough when fishing, so I always ask Peter to take the fish from my hook. I hold my rod up in the air and manoeuvre the fish towards Peter, while he grabs towards it. Then I suddenly hear him shout. The beast has bitten in his hand! His hand is red from the blood that gushes out the wound. Oh No! While I quickly look for water and bandages, Peter very calmly keeps his dripping hand above the water. 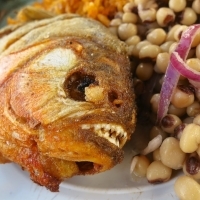 Like sharks, piranhas are attracted to blood, so maybe it gives us some extra fish for lunch. The piranha has left a tooth imprint on his hand. Luckily he did not bite a piece off! Whether it was the blood or our fishing techniques we don’t know, but the next hour we catch one fish after the other one. On the way back my eyes are focused on the bottom of the boat where the piranhas are floundering. 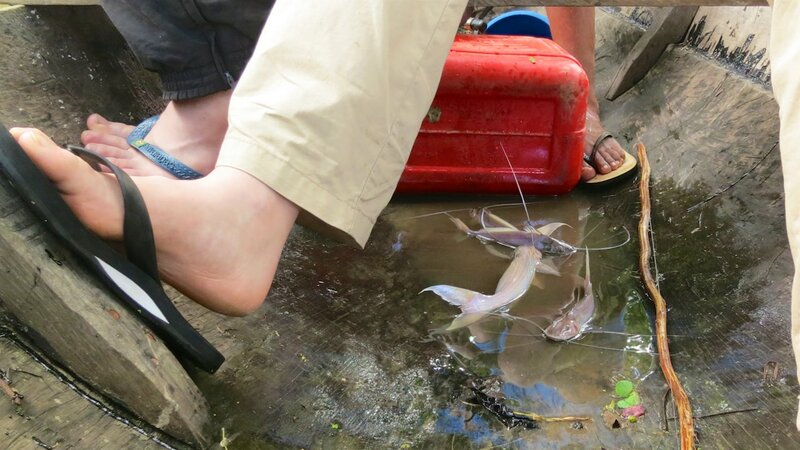 Dangerously close to my toes and this time with bigger teeth than the catfish. But fortunately it’s all good. Back at the boat Alicia prepares lunch and we each have a plate with a fried piranha. Even on the plate they look dangerous. After the first bite we understand immediately why we have worked so hard to catch them, because they taste very good! Despite nearly loosing a finger, Peter can’t wait to go fishing again that afternoon. And I must honestly say that I share his enthusiasm. Pedro is happy to go, because we need to eat again that evening anyway. We find a nice fishing spot at yet another small lake. It is very hot on the water. We float in the middle of the lagoon, right in the hot sun, without any wind. Luckily we have the right technique now and quickly catch a lot of fish. Once we have enough for dinner, we return to our bush hotel. When we are back Pedro jumps overboard into the river to cool off. Lucia shortly follows his example. It looks pretty nice, but I don’t trust the brown water. What about those piranhas and crocodiles? They assure me that those dangerous biters don’t swim in this river. When Peter then also changes into his swimming trunks, I decide to join them on this adventure. What a good decision, because the water is great! 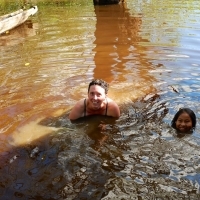 We swim laps around the boat and then take our soap for a quick bush shower. Pedro takes the French couple back to the harbour, while we hang around a bit. As the sun begins to set, we hear the first call of howler monkeys in the distance. The mosquitoes buzz also begins to swell, so it is time for us to go inside. It’s only seven o’clock when we have eaten, brushed our teeth and lie in bed. On the clock it is still very early, so not really time to go to bed. We try to read, but can’t keep our eyes open. It is dark, the birds are quiet and even the buzzing is softer now. Night in the jungle, so time to go to bed anyway. The next morning, Pedro wants to take us fishing one more time before we go back to Trinidad. 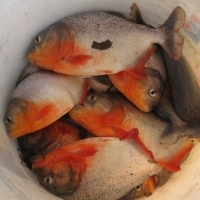 This time not for piranha, but for pacu. 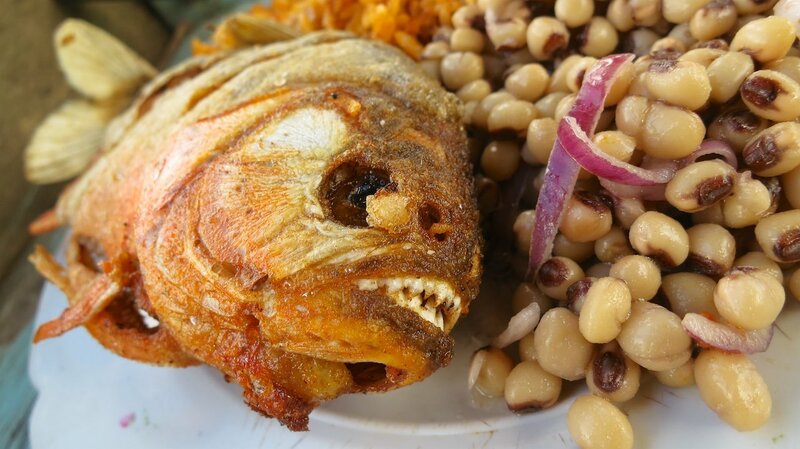 A larger predatory fish, which is supposed to taste even better than piranha. So much better that restaurants in the city pay big money for them. So today we will not fish for our lunch, but for Pedro and Don Pablo to make some money on the market. Don Pablo has also brought his neighbour for the occasion. 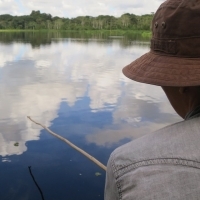 To catch pacu we need a better fishing spot that is even harder to reach. 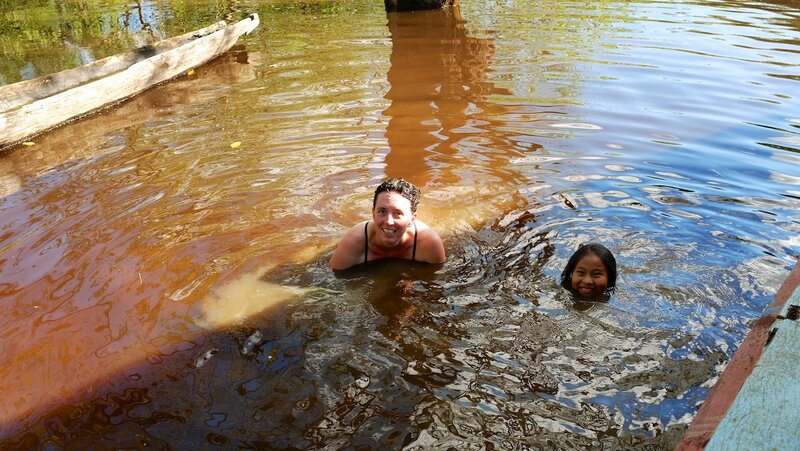 We navigate through the flooded forest. There is so little water that the boat gets stuck several times. 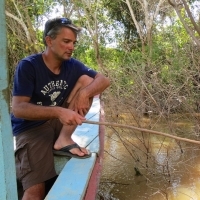 With the crocodile skull still fresh in my memory, I anxiously keep my hands inside the boat. Pedro however steps right into the water to push the boat a bit further! After a grueling journey we arrive at the fishing spot. With a large chunk of meat on the hook we throw in. It takes a long time before they bite. 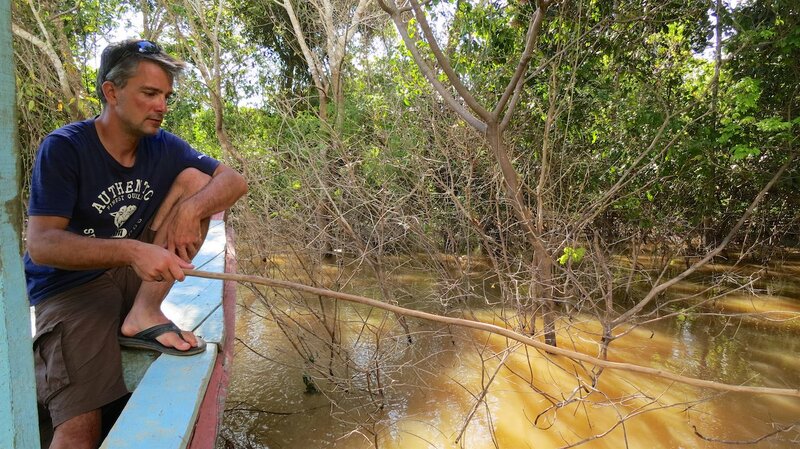 Peter is the first to almost catch a pacu, but the beast is very strong and able to fight himself loose of the hook. With a splash it falls back into the water. Pedro sighs, that’s too bad! He is also very disappointed because he only catches piranhas. 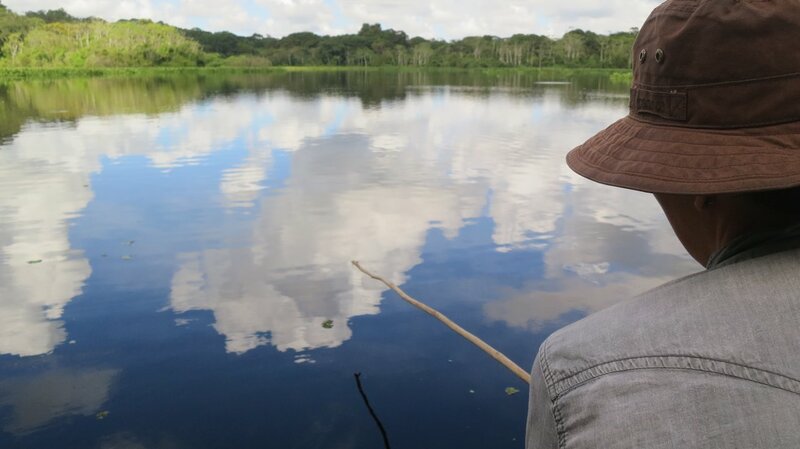 I am determined to catch at least one pacu and stare at the end of my rod very concentrated. I suddenly feel a jerk and pull up my rod. There is a fish on my line! The fish is extremely strong and fights a lot. I have to hold on to my rod, otherwise I might loose it. Pedro starts yelling that I have to get the fish into the boat. I manage to get the fish in the hands of Don Pablos neighbour who professionally takes the fish off the hook with a swift turn of his hand. 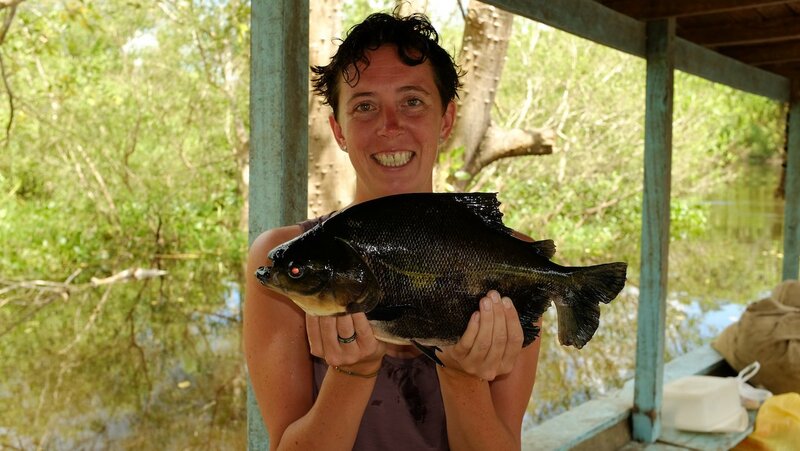 The fish is huge, a few times larger than the largest piranha we had caught. Wow! Proud of the first pacu of the day, I throw my rod in again with a new piece of meat. Pedro is visible hopeful. If the “turista” can catch a pacu, the fish must be hungry today. We sit in the boat in the blazing sun for a few more hours. 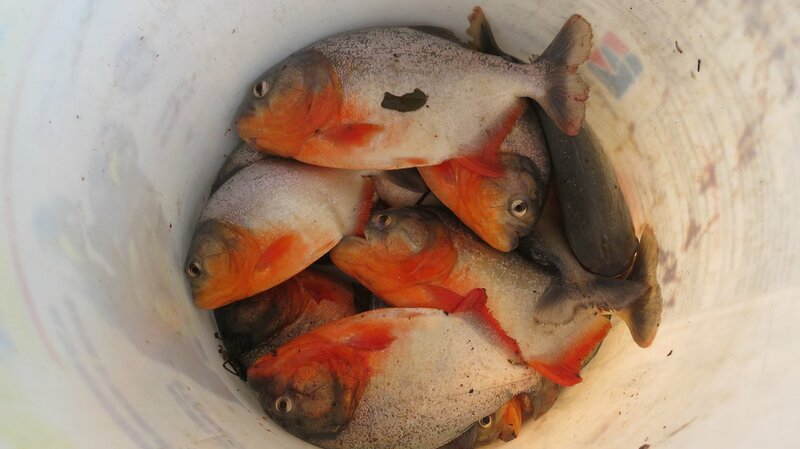 The men catch some more piranhas, but no pacu. Much to their surprise, I however catch no less than three pacus that day! Peter is a little disappointed, but also very proud. It’s not enough to sell in the market, so there is unfortunately no other option than to eat them ourselves. 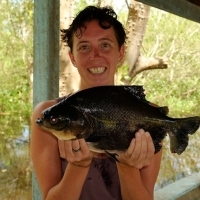 And they were right, pacu tastes even better than piranha! Thanks for sharing another great adventure. If I was there, there would be no need for bug spray – I’m a mosquito magnet! Wederom een prachtige belevenis. Door deze verhalen voelt het echt of de wereld zo voor het grijpen ligt. Aan alles komt een eind, maar dit pakken ze nooit meer af. Respect! Blij dat jullie gezond weer terug zijn. Hoop dat jullie verdere plannen ook een succes worden. Met een diepe buiging voor al die mooie verhalen. 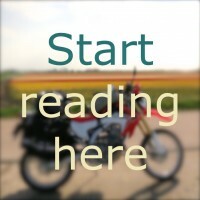 Very nice story, it almost feels as if i’m there myself a little when reading it! It sounds like you had quite an adventure!